This is the fourth in my series of Z80 retrocomputing blog posts. For background, I suggest starting with the first post. I could program an EPROM with my assembly language program, run it, then when it was time for the revision I could pop the EPROM out, erase and reprogram it, and repeat the cycle. I’ve done this before, and it’s a slow development cycle. You’re spending lots of time erasing and reprogramming EPROMs. I could write a bootloader and store that in the EPROM, and the bootloader could load a program from the serial port, or from an attached SD card, write that program to RAM, and execute it. This improves upon approach #1 by eliminating the need to erase and reprogram EPROMs. It requires some effort to local and/or write a boot loader. I could ditch the EPROM altogether, put some static RAM in its place, and come up with a way to program the static ram in-circuit. The bus supervisor implements approach #3. I’m going to get rid of the RC2014’s ROM board, install a dual-RAM board in it’s place. Then I’m going to attach a raspberry pi to the Z80’s bus, let it put the Z80 to sleep, and have the pi program the RAM chip. Taking a look at the above schematic, we can see three IO expanders. Two are MCP23017 and one is a PCF8574. The MCP23017 are 16-bit IO expanders, and are by far the more versatile of the two chips, featuring configurable pull-ups, many different interrupt modes, etc. The PCF8574 is a much simpler chip and features only 8 bits of IO. We only need about 36 bits of IO to make this project work, so I opted to go with two MCP23017 and one PCF8574. The MCP23017 and PCF8574 are both I2C devices, and they can communicate with the raspberry pi over a 3-pin (SDA, SCL, GND) i2c bus. I’ve used I2c in several of my projects. It’s really convenient and makes it easy to add peripherals to the pi. As you can see, the entire address (A0..A15), data (D0..D7), and the majority of the control (M1, IORQ, MREQ, RD, WR, RESET, CLK, INT, BUSREQ, BUSAK) are connected to the IO expanders. They’re connected via some dip resistor packs. These aren’t necessary for correctness; they’re install to have some protection against operator error. If I program the MCP23017 incorrectly, then it would be possible to be outputting a “1″ on some pin while the Z80 is outputting a “0″, allowing current to flow in an undesirable way (perhaps burning out an IO line on one device or the other). The resistors limit the amount of current that can flow in the event of a mistake. I chose to use 470 ohm resistors, on the basis that it’s what I had in the junk box. Also on the board is a clock generator. The supervisor board replaces the RC2014’s default clock board. The reason for this is twofold: 1) save on backplane space, and 2) to be able to stop the clock or implement a slow clock. I use a 7.3728 Mhz crystal oscillator, and it’s connected to a pair of NAND gates. If the CLKEN (PCF8574 output #3) signal is low then the on-board oscillator will be disabled. Outputting a squarewave on the CLKOUT (PCF8574 output #4) signal can then clock the Z80. It may be obvious (particularly from the little yellow wires) that there’s a few mistakes in the above board. These have already been corrected in the schematic. The next time I fab the pcboard (if there is a next time), I’ll correct the imperfections. This one fixed the errors in wiring the hex inverter, spaced the resistor packs apart so they aren’t jammed into the side of each other, and added the ability for one of the MCP23017 chips to generate interrupt signals on the Z80’s WAIT pin. This allows me to implement single stepping using the bus supervisor. Okay now to the software… Our first task is to seize control of the Z80 bus. It’s handy that the Z80 provides a pair of pins for just this purpose. 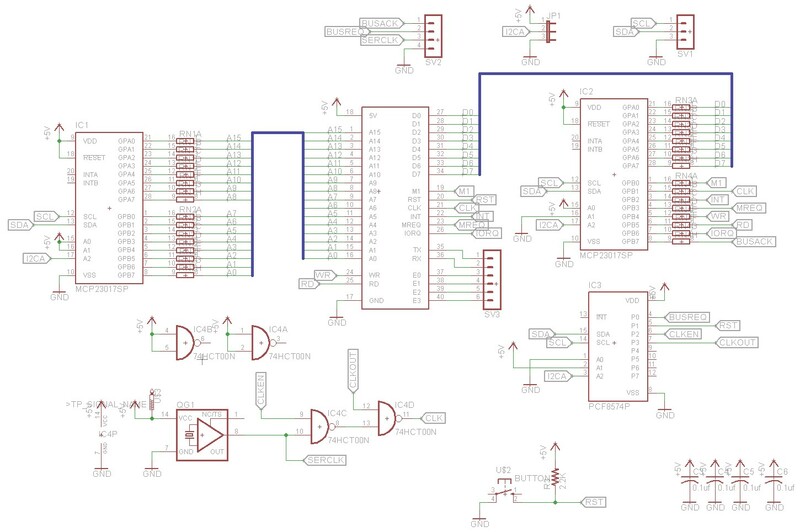 If we make BUSREQ low, then the Z80 will give up the bus, and everything important goes into tristate. Once it’s done this, it’ll set BUSACK low. Once we see BUSACK is low, the bus is ours to do with as we please. We need to reconfigure our MCP23017 io expanders so that the relevant pins are outputs instead of inputs. Then the pi can write to those IO pins. For example, we can put an address on the address bus, set RD and MREQ low, and then read the data bus. That’s how we can examine a memory address. In a similar manner, we can also write memory (set WR low instead of RD), and we can read and write IO ports (set IORQ low instead of MREQ). This allows the raspberry pi to interact with the Z80’s memory and IO devices. We can dump a RAM chip by looping through all of the addresses, issuing a read of each one, and then writing the result to a file. We can do the reverse by reading a file, looping through all of the addresses, and issuing a memory write for each one. When we’re done, we simply set BUSREQ back to high, and the Z80 will resume whatever it was doing. Since the PCF8574 io expander is connected to the reset pin, all we need to do to is set RESET low and then return it to high again. If you’ve jumped ahead and read my post on the SingleStep board (part #5 in my retrocomputing series), then you’ll know that it’s possible to single-step a Z80 by monitoring the M1 pin, and outputting a signal at the right time on the WAIT pin. On my first revision of the bus supervisor, I didn’t think of this, but on the second revision I came up with what I think is a clever way to implement it without any additional chips. The MCP23017 can generate an interrupt output when one of the pins that it’s monitoring differs from a preset value. So what I did is to configure to MCP23017 to generate an open-drain active-low interrupt whenever the M1 signal goes low. I then sent this input to the WAIT pin of the Z80. This will cause the CPU to pause every time it executes an instruction. To continue, all we need to do is to read the MCP23017 and it will reset the MCP23017’s interrupt output. Just reading it once isn’t quite enough. If M1 is still low, it’ll immediately reassert the interrupt and keep holding WAIT low. I actually had to enter a tight loop to keep reading the MCP23017 until M1 went high. It’s not perfect, but it kinda-sorta works. The source code for the supervisor program is available in my github repo at http://www.github.com/sbelectroncs/rc2014. Like most of the other RC2014 boards on my blog, I’ve made it available on Osh Park. They’re only sold in qty 3, and I don’t make any money from the sales. Order at your own risk — I’m not a kitbuilder or kit seller, just some guy who designed a board, tried it out, and made it available to others. I like your I2C chain to control the bus. I may borrow the design instead of putting an arduino on my board. If you want to remove the RasPi from the project I recommend you use something like FTDI’s FT260. That would allow you to communicate via USART and I2C over a single USB connection making a very compact dev system. What modifications need to be made to the Z80 processor board to enable access to “BUSREQ” and “BUSACK”? Is it just a case of setting the relevant jumpers on the CPU board? What changes need to be made to the Z80 CPU board to expose BUSREQ and BUSACK? I’m struggling to find the information. I’ve been watching the videos in this series and I wanted to thank you for them. They’ve been great for inspiring me to do a similar project. One and only comment so far is that this page has a typo for your github repository. You’ve misspelled sbelectronics so the link should be http://www.github.com/sbelectronics/rc2014.